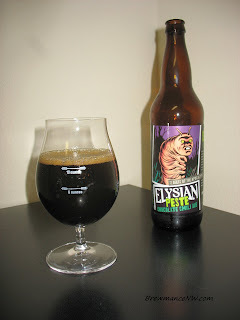 Here’s the 4th beer in the Elysian Brewing 12-Beers of the Apocalypse series. 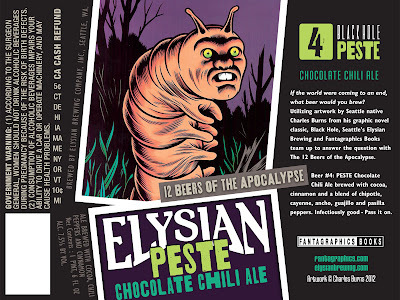 Up today we have Peste Chocolate Chili Ale. Peste is Spanish for “over” and I’m not sure I can get over the creepy Fantagraphics caterpillar (with teeth) on the label. 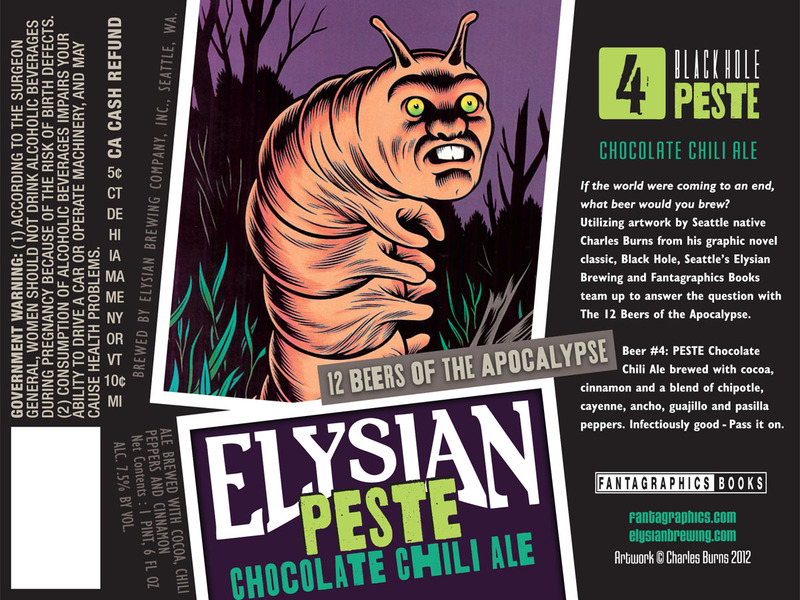 Peste is 7% ABV and brewed with cocoa, cinnamon & a blend of chipotle, cayenne, ancho, guajillo & Passilla chili peppers and it will be packaged in 22oz bottles. - Pours a very dark murky brown with tan fluffy fingers of head that settled down quite a bit to just a scatter of light dusting over the rather still and stagnant brew. Looked very good at the start.. quickly fizzled away. - I certainly get a lot of cinnamon up front. I also get a very herbal aroma with some sweet fruit, light cocoa, and light sweet grain. Some chili may be there, but is timid in the aroma. - I like the sweet and light malt backing of cocoa, sugars, and cinnamon. The cayenne and chipotle peppers strike with a vengeance and heat the rear of the tongue to very high marks. There isn't too much in the flavor of the pepper, but more in just the heat. The heat certainly strikes towards the finish. Though I like hot stuff, this is a bit too hot. 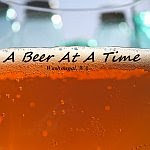 - This brew is a little thin, but medium bodied. It is well carbonated enough and a bit chewy. The heat rides on a blanket of it's own, which is like a fire flavored liquor sailing about a chewy medium bodied brew... it separates itself. - Too hot. It's a decent or okay tasting background brew, but it seems a mediocre beer was flipped inside and out with hot peppers... and let's just throw in some other stuff like cinnamon (which too is overpowering) just to mix it up. This is a mixed bag, and leaves me feeling like I am missing something. For the lover of hot peppers.. this beer is for you. I just find it a little hard to enjoy. Perhaps it would pair well with vanilla iced cream? You do not like hot stuff. You like MEDIUM hot stuff. This beer is perfect.